The apartment has a feature that might not be apparent right away, but it was very striking at it’s time. It has an underfloor heating system. These systems were very popular in the Tapiola, Espoo in the 50s and 60s, when the original Garden City was built (my building is from 1958). Underfloor heating fit the architectural ideals, because there was no need for visible radiators. The original floor was linoleum, which was also popular during that time. And later (in the 80s, judging from the materials) someone put a parquet floor over the original linoleum. 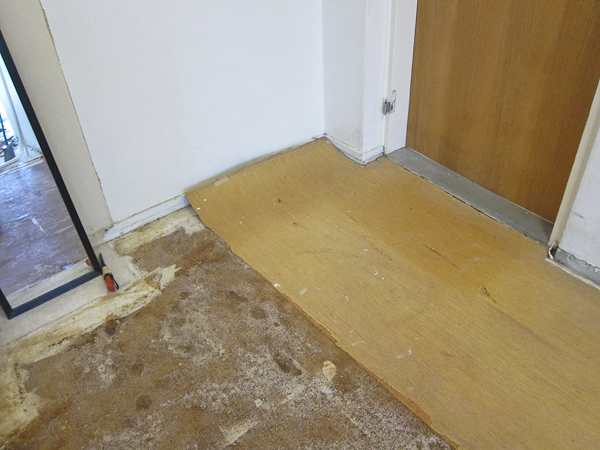 The original lino, a cardboard and cork-fragment underlay and the parquet are visible on the top photo, taken after I removed the AAC kitchen wall. That parquet was now in a pretty bad state. It seemed to have been put together from odds and ends to begin with, since some of the pieces were just 5 or 10 cm long at places. I pondered the pros and cons of having the original parquet sanded and refinished or replacing it with something else. 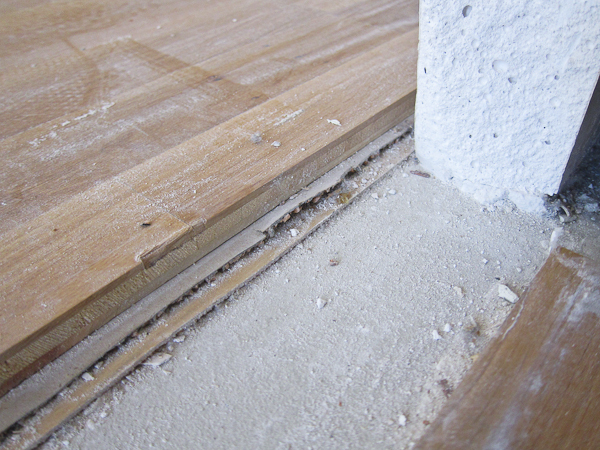 In the end the replacing won – the parquet was cheap quality with a thin top layer (about 2 mm), and the sanding and finishing process could have ended up costing more than replacing the floor. The underfloor heating would also work more efficiently with fewer layers. So the scrapping began. 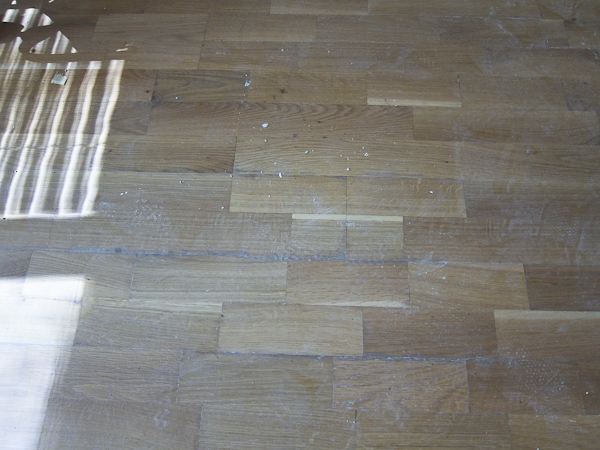 First I ripped of the parquet, which was glued together. It didn’t go without a fight, but I emerged victorious! 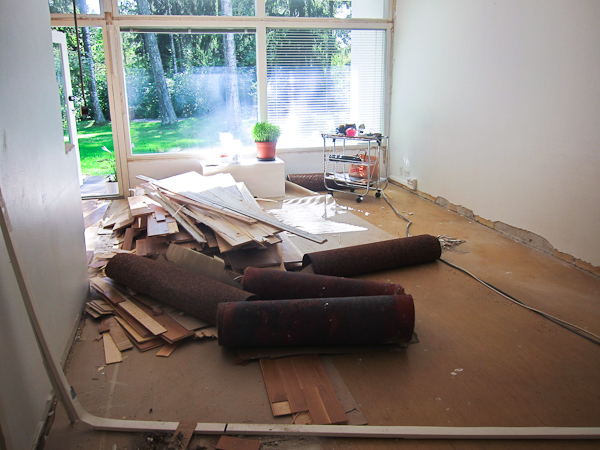 It’s unbelievable how much scrap material ripping the floor produces… You’d never think there’s so much volume there! You can see the original lino on the hallway floor, and the concrete underneath. The lists were also original, visible in the hallway. The parquet had been laid next to them. So, I took a hammer and lightly tapped the plaster until all of the loose plaster came off and I was left with stuff that was still sticking firmly. You can hear and feel the difference easily. 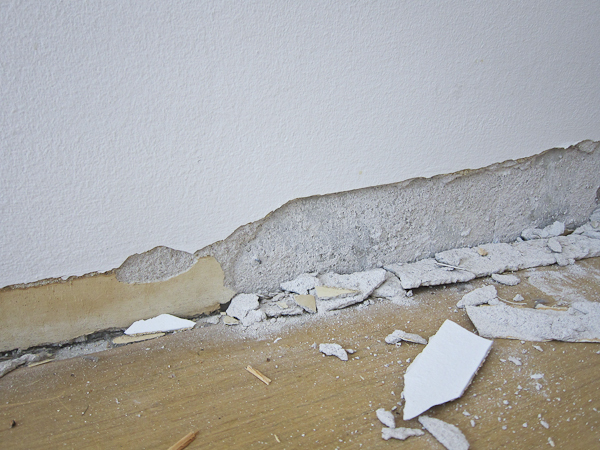 Luckily, this wasn’t too far from the floor – I didn’t really want to have to redo the whole plaster as that’s a major PITA. 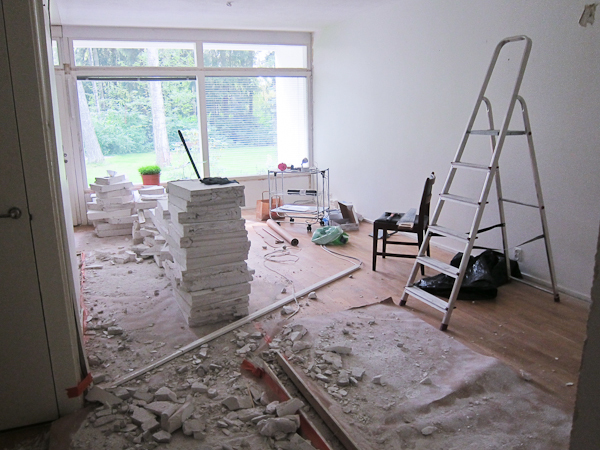 Renovation: Off with the Walls! 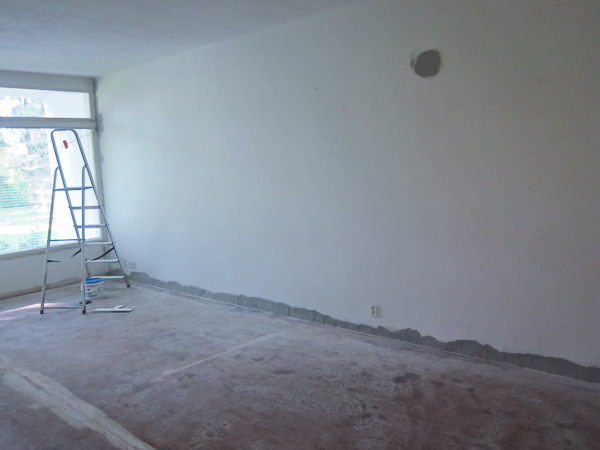 I started on the reno right after getting the permission to change the walls. 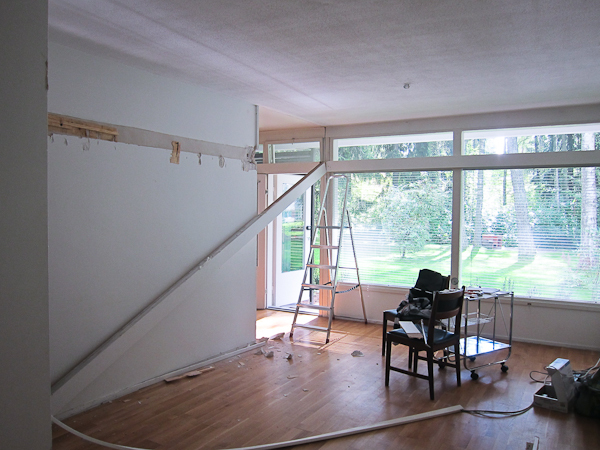 First I had to get rid of the beams around the living room (here’s the before pics). They weighed a lot and were attached well, but I had a lot of enthusiasm and a crowbar! Next I had to get rid of the unwanted walls. The material was AAC, a lightweight concrete called Siporex. 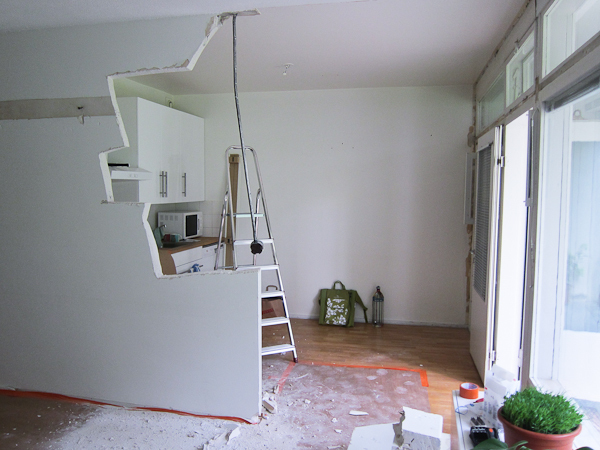 Some of my friends suggested hammering them down, but I was afraid that would damage the bathroom wall and the waterproof lining (a layout of the apartment here). That would’ve been an expensive problem and one I very much wanted to avoid. So I bought a saw. Looking back, it might have been easier to rent a motorized version, yes. But at the time I didn’t know how long the sawing would take, and the hand saw was cheap. I figured I could always rent the motor saw if it proved too hard to saw by hand. 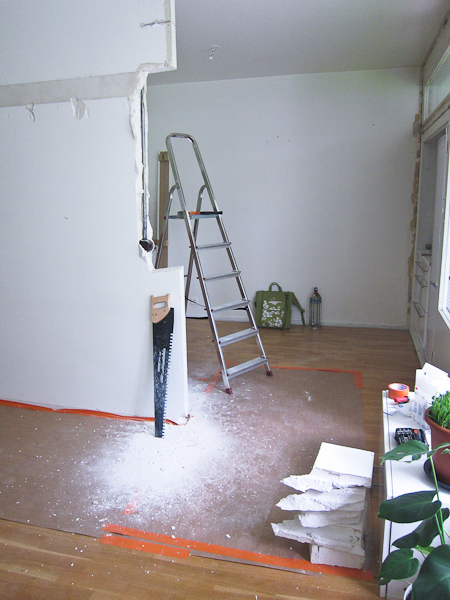 I didn’t yet have a permission to change the layout of the kitchen (yes, in Finland you need a lot of permissions…) when I was taking down the walls, so I had to protect the kitchen. 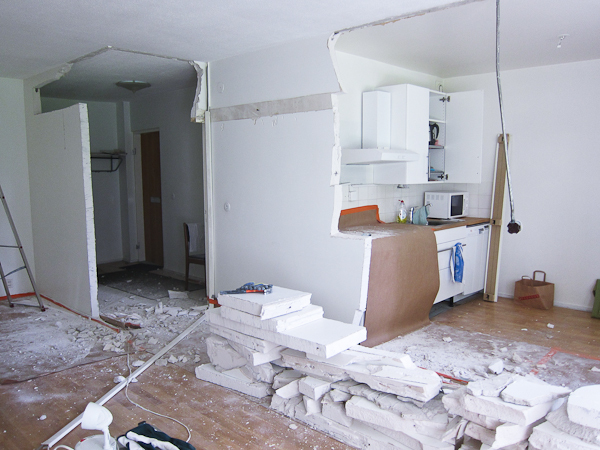 I didn’t want to put money into a reno if I couldn’t get the kitchen the way I wanted it, so in that scenario keeping the old one would’ve made sense – but oh, how glad I am that I got to change it around!